Lakes distillery has created the ‘world’s first’ Scotch-English hybrid whisky, which is being released ahead of its first single malt next month. 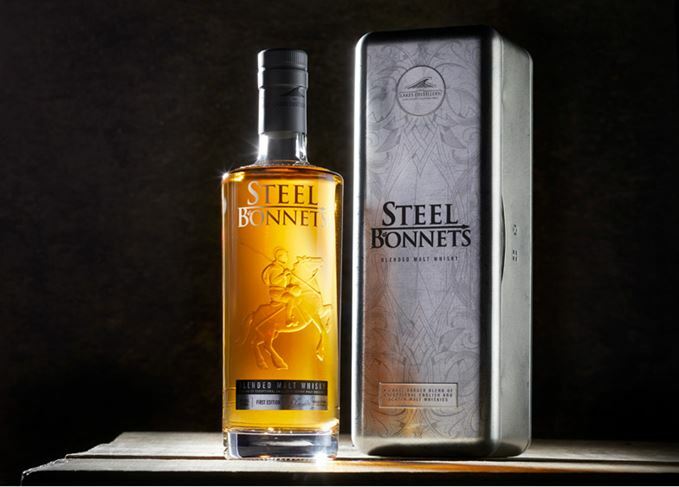 Steel Bonnets is a blend of the Cumbrian distillery’s single malt, along with ‘some of the most respected malts from Scotland’, which has been matured in a combination of Sherry and Bourbon casks. Bottled at 46.6% abv, the hybrid malt is said to have a ‘creamy, slightly nutty and full-bodied flavour’ with ‘a sweet layer of woodsmoke’ according to the distillery’s chief whisky maker Dhavall Gandhi. The whisky takes its name from the moniker given by the English and Scots to the reivers who inhabited the Borders between the two countries, but who identified as being neither Scottish nor English. The Lakes distillery itself is based near Bassenthwaite Lake in the Lake District, around 35 miles from the English-Scottish border. Priced at £65, the hybrid whisky will be released on 9 July as part of the distillery’s core range, but is available to pre-order via the Lakes distillery website now. The launch of Steel Bonnets precedes the release of Lakes distillery’s first single malt whisky next month. The Lakes Genesis has been matured in oloroso hogsheads and finished in ‘casks made from American and European oak’ before being transferred to orange wine casks from Andalucía. Described as having notes of dried ginger, fruit, vanilla and chocolate orange, the whisky is bottled at a natural cask strength of 58.3%. Of 101 bottles created, 99 individually numbered editions will be auctioned by whiskyautcioneer.com between 29 June to 10 July. The remaining two bottles will be retained by the distillery. While Steel Bonnets may be the first Scots-English hybrid blended malt, Scotch has been combined with other nations’ whiskies in the past to create a variety of expressions. In 2004 Bruichladdich combined its malt with Irish whiskey from Cooley distillery to create Celtic Nations, a whisky revived by Teeling Distillery Co. in the form of Hybrid Edition 1 in 2012. In 2015 Adelphi Distillery Ltd combined Scotch with Japanese whisky for The Glover, while Diageo launched Huxley, a blend of Scotch, Canadian and American whiskies in 2016. Bottle 1 of Genesis, the English distillery’s new single malt, breaks two world records.